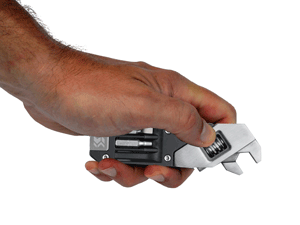 The X-Drive Adjustable Wrench Multitool is a versatile, 7-in-1 tool for the toolbox, glove compartment or emergency kit. This stainless steel wrench features a Phillips #2 driver bit, a flat #2 driver bit, flat 3/32-inch screwdriver, Allen 1/8-inch driver bit, a hook knife and serrated knife. 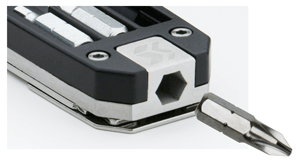 It features precision-action wrench adjustment and a bit socket with a magnetic lock to fit all standard ¼-inch bits. 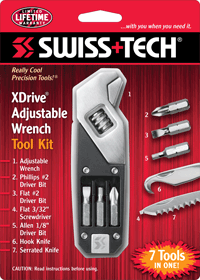 This professional grade tool delivers heavy-duty, long-lasting reliability for a wide range of repair tasks. 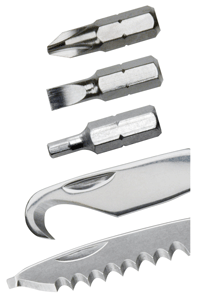 Product Size: 5.00” x 7.00” x 0.50"